Bare carbon paste electrode (BCPE) is modified by electropolymerised film of calmagite. 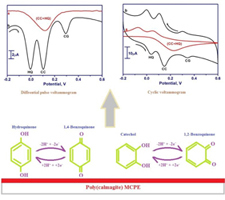 The fabricated poly (calmagite) modified carbon paste electrode (MCPE) was used for the simultaneous electroanalysis of catechol (CC) and hydroquinone (HQ) in 0.2 M phosphate buffer solution (PBS) of pH 7.4. The fabricated poly (calmagite)MCPE has achieved the voltammetric separation of CC and HQ in a binary mixture by cyclic voltammetry (CV) and differential pulse voltammetry (DPV) techniques. The peak separation between the two oxidation potentials of the analytes (ΔEp) is 0.112V and 0.108V respectively by CV and DPV techniques. The elimination of the fouling effect by the oxidised product was achieved by the poly (calmagite)MCPE. From the study of scan rate variation the electrode process was found to be a diffusion-controlled process. The lower limit of detection (LOD) for CC and HQ is 2.55μM and 1.70μM in the linear concentration range of 20.6μM to 80.6μM by CV technique. The proposed method can be directly applied for the simultaneous electroanalysis of CC and HQ with high accuracy and precision at poly (calmagite)MCPE.